I wouldn’t call myself a ticketing expert and there are definitely ways to get hold of tickets that I’m not familiar with. Hence I shall just call this A SIMPLE GUIDE. Since there are tonnes of different ticket types, from train tickets to concert tickets to admission tickets for various resorts, I will be focusing on ticket purchasing METHODS. Note that I will be making the assumption that you aren’t able to make reservations over the phone in Japanese. If you find yourself wanting to buy tickets that quickly sell out once available and do not have friends in Japan who can help you, chances are that you have to opt for a web-based method to get hold of tickets. At a convenience store (店舗で引取) – this option is usually more feasible. Note, however, that there is usually a deadline before which you have to collect the tickets. At a ticket kiosk – this option is not always available. Delivery (配送) – this option almost certainly require you to have a domestic address which you can use for collection. As the tickets come in the mail, you have to buffer for delivery time. IF YOU NEED HELP WITH THIS, DROP US A COMMENT AND WE MAY BE ABLE TO HELP YOU WITH IT. Many small eateries (particularly chains) use a meal ticketing system. Good ones come with pictures next to the buttons while not-so-good ones simply have Japanese words written on each button. 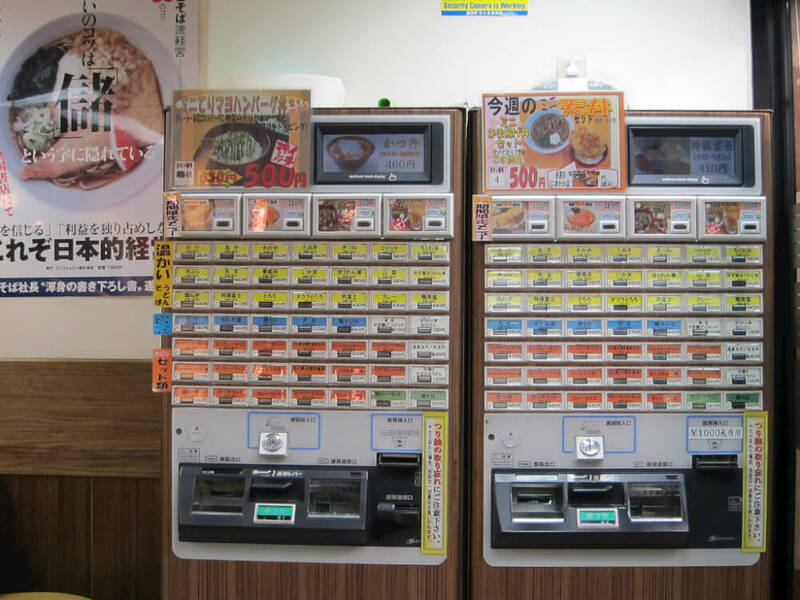 Some machines require you to choose take-away (を持ち帰り) or eating in (店内) before you can pick your item. Select the appropriate option. Select your item by pressing the associated button, a ticket slip should appear in the dispenser. Continue to select more items if you wish. Press the ‘return change’ (おつり) button. Pick up all the slips and pass them to the staff (they should already be hovering about you). The staff will direct you to a seat or standing space depending on how crowded the shop is. Train tickets are similar to meal tickets. Loppi – One of the most commonly used ticketing machines. They are found in almost all Lawson and MiniStop convenience stores. Fortunately, Lawson has provided a very informative English guide to using Loppi. Lawson has a stranglehold (i.e. sole distribution) on many tickets such as the Fujiko F Fujio Museum i.e. Doraemon Museum. Here is a guide on using Loppi to buy tickets for Ghibli Museum. FamiPort – FamiPort is the Family Mart version of Loppi. 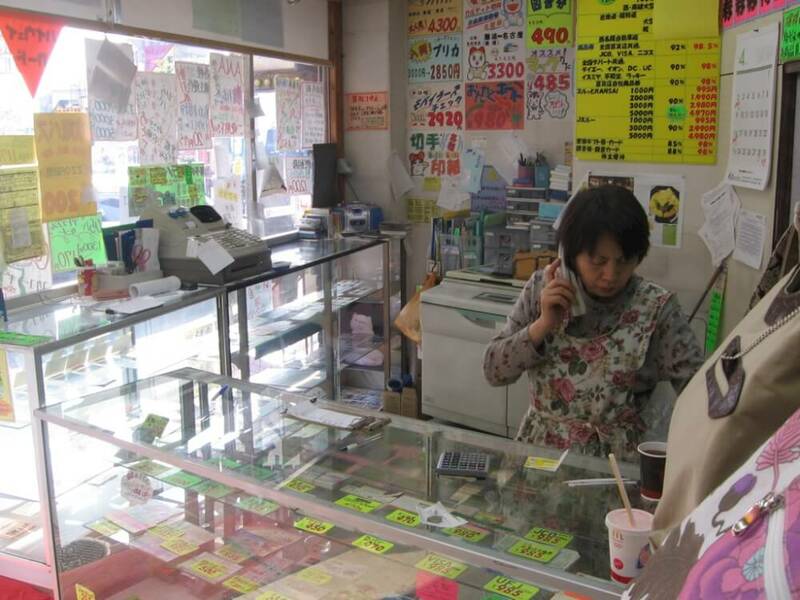 JTB (Japan Tourism Bureau) shops handle many different kinds of tickets and bookings and are extremely trustworthy. You can find them almost everywhere in Japan. JR Ticket Offices would be where you could ask questions and buy tickets for trains, shinkansens and buses. Some of the web-ticketing agents like Ticket Pia also have physical shops. Most of this shops have staff that can handle some English and in the event that they can’t, simple gesturing should get you far enough. Words like chiketto (essentially ‘ticket’), kippu (ticket, usually for transport) and ken (slips, usually for payment, meal tickets and airplane tickets) should come in handy. These small shops are found usually in crowded areas near train stations and become immediately obvious with all kinds of tickets and vouchers display in their shopfront. Some of these have chains are so successful they even have their own websites. Like Kounan and Daikokuya! Overseas agents basically allow you to buy tickets in a shop overseas and use them in Japan. The biggest plus point is that they speak your language (phone calls become possible!). The prices may, however, be marked up. For example, Ghibli Museum has ticketing agents around the world. JTB has shopfronts all over the world as well. These are mainly used when tickets are sold out and holders try to sell them at a profit. Sometimes, you get good deals from sellers who bought tickets but realised they couldn’t use them. However, almost all of these sites are purely in Japanese.